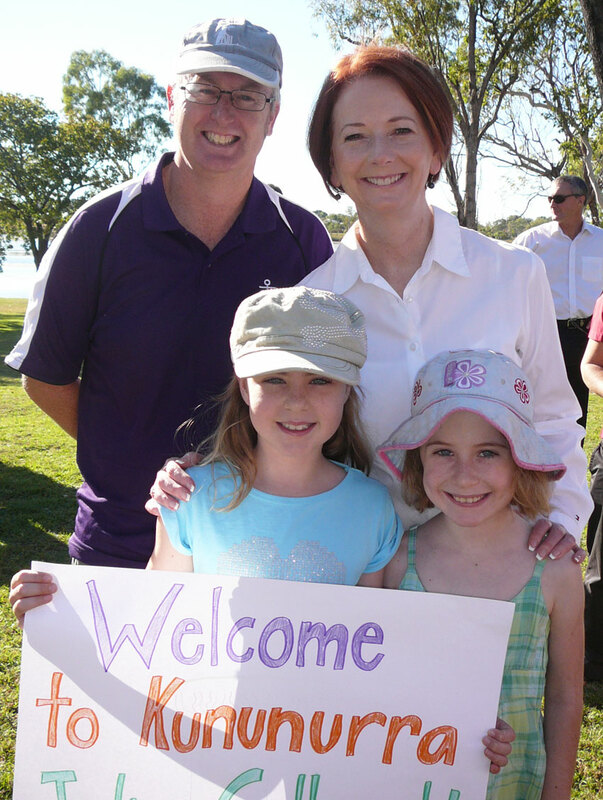 Patchy Work of Mini Grey: A Brush With the Prime Minister. A Brush With the Prime Minister. Well a slight interuption to the sewing this morning as we rub shoulders with Australia's Prime Minister, Ms Julia Gillard. She is up in this corner of Australia doing a two day whirlwind tour. We couldn't miss the opportunity to go down to the local park this morning, watch her plant a tree and say hello. I helped the girls make a quick sign to attract her attention and it worked! 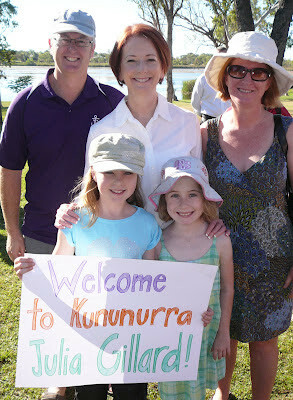 Half way through the planting, her media man came over and asked if she had seen the sign Grace was holding. I said she had made eye contact and he said he would make sure she came and said hello. She was very friendly, shook the girls hands and asked them their names. I took the first photo and then she suggested that maybe I would like to be in the next shot. All very exciting! Hey your rubbing shoulders with some important peeps up your way Helen. That would have been a thrill for me. I know it's a publicity junket, but I would still be proud that she singled your family out. Great pics. So cool! She looks like part of your family! Well, how cool was that? I think you should frame that photo! awesome! Look at you hobnobbing with the bigshots!! How fun! super cool for the girls to meet a female PM. That doesn't happen every day. Pink and Purple Zig Zags.